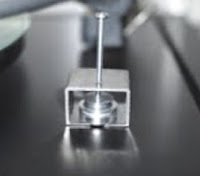 We notice that in much more expensive Rega models like P7 & P9, the pulley systems used are different from that of the lower series of Rega turntables. Let's take a closer look at this dual pulley system with two rubber belts which is used in these higher series TT to drive the sub-platter/platter. Can we use it for our humble turntables? Why do we want to use dual pulley and two rubber belts??? With one tiny belt, there is less efficient energy transfer. Thus it is ''strenuous'' for the motor to move a combined load of more than 2 kg (sub-platter, platter, record.. etc). However, if two belts are used, much more energy is transferred to turn the platter. This is evident from half the time taken for the platter to attain full speed with two belts compared to time taken using single belt. Recently, I further upgrade my Planar 3 with a dual stainless steel pulley. The turntable is tested (for 33.3 rpm only, since this Planar 3 is without an external power supply (PSU) for switching between 33.3 rpm and 45 rpm). 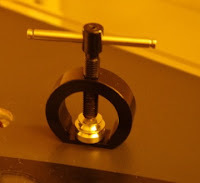 And I am glad that the result obtained is not only shorter time to attain full speed as I've mentioned earlier, but steadier speed of rotation and pitch stability, thus a very significant sonic improvement for turntable. Recommend this as a very cost effective upgrade and haven't even put the white belts on yet. If you are on the fence on this upgrade.....just do it! before i fitted the new pulley i played inxs kick and the gorillaz the fall ,then played them again with the pulley, immediate impressions are of a cleaner presentation, on one of the inxs tracks there is piano at both left and right extremes of the sound stage, previously these pianos were coming from a long way behind the speakers, with the new pulley those same piano's are brought forward and extended farther out to the left and right of the sound stage, bass on the gorillaz lp seems faster even though the deck is actually playing slower than before! My next upgrades was Michael Lim's double pulley. i did not expect the improvement will be big after the white belt, but this again took me by surprise! This took my P3-24's sound quality to a higher level. I am experiencing all these guys' same experience with this double pulley and at the time I had only one white belt and one stock belt while waiting for another white belt to turn up. Luckily it turned up two days later and again, I couldn't believe it, the white belt add stability to the bass and firm up the image yet again, although slightly but so worth it. Thank you Michael, the double pulley has made the biggest improvement compare to all the previous ones. .... I have to admit that I installed the double pulley last night I (couldn't wait), and wow! talk about putting some snap into the system! Holy mackerel! This P5 is now freaking amazing sounding to me, as good as some much more high-ticket TT's I've heard for under $3500K(I'm talking VPI, Scheu), but the Shindo TT still sounded better, but mostly in pitch stability and solidity of sound image. This could have been synergistic thing with an all-Shindo system. But we're talking $20K here for the table alone, and I 'm not even close to being disappointed in my P5's sound after all this work. Just as a follow up, the setup is still sounding fantastic with Michael Lim's two mods: the double belt pulley and motor isolation base. My last upgrade was the Michael Lim double pulley(with white belts) which seems to have nicely tied together all my other upgrades. It's as if the image has been fine focused with the added bonus of more articulated bass. By the way, those of you with an RP3 you can use the standard Lim double pulley without having to modify the motor mount or the pulley itself. Now I've listened quite a while with the new dual pulley and I must say I am really pleased with it and it was another sonic improvement for my P25 (even if the assembly was not as easy as I hoped ...). I have received the pulley and have had it running for a few months now, its a vast improvement over the stock issue and compliments all the other turntable mods I have made perfectly. The pulley maintains it perfectly... great product at a great price. The double pulley works beyond my expectations. It solved the pitch stability issues I was dealing with, but to my surprise it brought lifelike relalism, fast transients, more details, controlled still lively bass. All this without sacrificing any of Rega's strength or ruining the Rega sound. Just installed the dual pulley on my P5. Just wanted to say it's an outstanding upgrade. I have a delrin platter which is slightly heavier than the standard glass and it comes up to speed much quicker now. Speed stability is also improved and the sonic improvements especially it seems in the lower end is tighter and more defined. 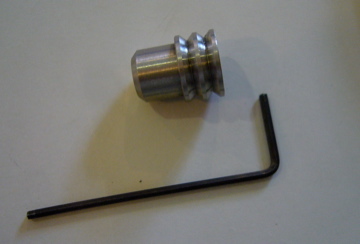 For anyone who is not sure about this upgrade due to fears of removing the original pulley just order the pulley puller. 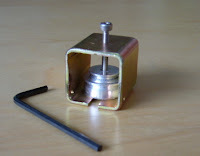 The old pulley came off easily without the need for any acetone. Well worth the $12.00. A (very) quick update. Pulley and belts fitted to my Rega Based self build turntable. Stunning! Rhythmically everything has just snapped into place! You may have to wait a while for further comments – I’ve got a pile of vinyl to plough through. In short, two things have not been difficult to hear – The timing & rhythm are stunning and the solidity of the sound as imaging are superb! Even my much better half, a self-confessed ‘tone deaf’ lady has made very positive comments. The pulleys are here. They are perfect . Thank you for everything. I had time to try your pulley and I can confirm now that it is very very good. The sound and the stage are improved a lot, especially because I have the chance to use two belt, of course better than one. Thank you very much and congratulation! The pulley and silicone belts were received a couple of weeks ago and I installed them right away. I agree with other purchasers of the double pulley in that it yields a significant improvement in pace, rythm and timing or what is termed PRaT. I feel this upgrade was very worthwhile in my setup. The pulley showed up today. It makes an amazing difference to my setup! Wish I had ordered this a long time ago. Hi, i have rp1 50 hz. Need to use in 60 hz. Please confirm If need Belt, or Belt and pulley to adapt the TT. dual pulley (60Hz) for 60Hz region. Rega tables are notorious for spinning a little to fast. Any chance the extra belt may increase the speed? 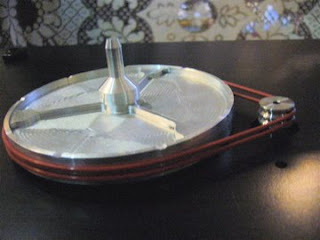 You can use one of my aluminium sub-platter with larger diameter to slow down your deck a little. My dual pulley with silicone belts are a tad faster to cater for the needle drag.